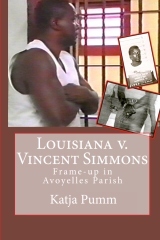 Vincent Simmons’ hometown is Mansura, Louisiana. It is known for a traditional event beyond Louisiana’s borders. As every year, the annual Cochon de Lait (“milk-fed pig”) festival takes place on the second weekend of May – also this time again. It begins today (May 12, 2011) and lasts until Sunday, May 15, 2011. Cochon de Lait is a delecacy of the French cuisine that former long term Sheriff Fabius Odell “Potch” Didier (a key figure in Simmons’ case) loved to serve his guests on special occasions. A few weeks old milk-fed pigs are roasted for thirty-eight hours over slow fire before they are ready to be dished. The schedule of the event is available at cochondelaitfestival.com . “Cochon De Lait” slideshow by gwapo39.